Hey everyone, just a quick note to let you know that I am guest posting today over at Flights Tights & Movie Nights [that link takes you to my post]. Bubba Wheat is hosting a debate over what films should be included in a list of 100 Essential Superhero Movies. I am arguing in favor of The Meteor Man (as if it needs to be defended, the movie is practically perfect). So head on over there, comment, and vote with your heart. 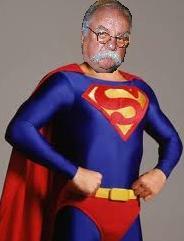 And no, Superman Brimley has nothing to do with anything. Just that we should never forget. .